Test Item Cluster (TIC) is a group of special tests which are developed to facilitate clinical decision making by improving the diagnostic utility. 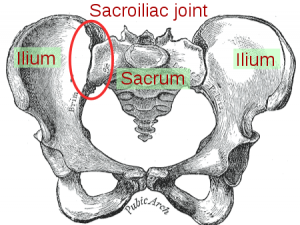 The ability to accurately differentiate a diagnosis of sacroiliac joint (SIJ) pain is clinically important. Although debated throughout literature, it is generally accepted that 10-25% of patients who present with mechanical low back or buttock pain will have this pain secondary to sacroiliac joint pain. To be able to correctly diagnose the sacroiliac joint as a source of pain will allow clinicians to be able to deliver appropriate treatment methods to the correct patients, thereby providing the patient with a more timely recovery. A study by Levangie et al had developed a TIC for identifying SIJ dysfunction with the following tests: standing flexion test, sitting PSIS palpation, supine long sitting test, and prone knee flexion test. The investigators assessed the diagnostic utility of those tests by comparing findings of patients who complained of LBP with those of patients being treated for other physical impairments not related to the back. They reported that the cluster of these tests exhibited a sensitivity of 0.82, specificity of 0.88, + LR of 6.83, and - LR of 0.20. It needs to be noted, however, that the reliability of those special tests used for this TIC is poor. Inter-rater reliability kappa values of standing flexion test, sitting PSIS palpation, and prone knee flexion test are reported as follows: 0.08 - 0.32, 0.23 - 0.37, 0.21 - 0.26 respectively. Additionally, validity of the results should be evaluated carefully due to the reference standard used for this study. More recently, Laslett et al assessed the diagnostic utility of the McKenzie evaluation combined with the following SIJ tests: distraction, thigh thrust, Gaenslen, compression, and sacral thrust. The McKenzie assessment consisted of flexion in standing, extension in standing, and right/left side bending, flexion in lying and extension in lying. The repeated movements were performed in sets of 10, while centralization and peripheralization of symptoms were recorded. The centralization phenomena with repeated movement was used to identify the patients with discogenic pain. After the McKenzie evaluation, patients with discogenic pain was ruled out. Authors found that the cluster of SIJ tests used within the context of a specific clinical reasoning process can facilitate identifying the involvement of SIJ dysfunction. Laslett et al further investigated the diagnostic power of pain provocation sacroiliac joint (SIJ) tests individually and in various combinations, in relation to a diagnostic injection. The tests employed in this study were: distraction, right sided thigh thrust, right sided Gaenslen's test, compression, and sacral thrust. Those tests were chosen due to its acceptable inter-rater reliability. They found that composites of provocation SIJ tests had significant diagnostic utility. Any 2 of 4 selected tests (distraction, thigh thrust, compression, and sacral thrust) have the best predictive power. When all 6 SIJ provocation tests do not reproduce symptoms, SIJ pathology can be ruled-out. The current ‘gold standard’ for diagnosing sacroiliac pathologies is a diagnostic nerve block, whereby anaesthetic is inserted into the SIJ, under fluoroscopy guidance. Some authors argue that if the patient achieves 50-75% pain relief, on 2 occasions with short and long acting nerve block, a diagnosis of SIJ dysfunction can be made, but with caution. However, even with a gold standard there are issues reported in the literature with the injection process. Five instances of leakage of anaesthetic from the SIJ nerve blocks resulting in temporary sciatic nerve palsy have been reported, with one study stating that leakage of the contrast medium used to guide nerve block injections was found in 61% of patients. There is now thought that the gold standard of SIJ nerve block may not be the most appropriate and so the IASP diagnostic criteria for SIJ pain no longer as valid as it once was. A review by Berthelot (2006) also concluded that joint injections are unreliable for diagnosing sacroiliac joint pain; however, this study did not show clarity in the description of the methods used to search and screen each paper, and so the possibility of bias within the literature chosen increases, thereby raising questions as to the validity of this conclusion. This is not in agreement with a review conducted by Simopoulos et al (2012), which concluded that sacroiliac joint blocks are valid as a gold standard, however based on the literature reviewed; there could be a false positive rate of 20%. With these factors in mind finding a method which is both cost-effective and has strong enough predictive values to accurately diagnose pathologies, thereby avoiding unnecessary cost and invasive procedures, and aiding in the correct treatment of patients. These studies were evaluated against the CEBM criteria for a diagnostic reference study in order to assess the methodological quality of the studies and to review the validity of the results and conclusions made by each study. There have been several studies investigating the reliability of using multiple orthopaedic tests compared to the ‘gold standard’ of nerve blocks, and several reviews which aim to synthesise studies of this nature to guide clinical practice. Van der Wurff et al (2006) used a regimen of five tests (Distraction, compression, thigh thrust, Gaenslens and Patricks). The study did not provide a reference for the study on which these tests were based, however it cites Kokmeyer et al (2000) to provide clarity on the execution of the tests. This regimen of tests was also chosen in a similar study by Laslett (2003). This study provided justification for its choice of the same five tests used by van der Wurff (2006) based on the inter-rater reliability reported by Laslett and Williams (1994), with all tests having a kappa value of 0.52-0.88, showing fair to excellent reliability. Studies also differ in the application of the reference standard of the nerve blocks. Van der Wurff et al (2006) based their injections procedure on the published literature, and adopted the standards set by the International Spinal Injection Society in order to measure the success of injections. This standard states that ‘a patient can be deemed to have sacroiliac joint pain should a radiographically guided injection of both long and short term anaesthetic reduce their characteristic pain’. In contrast to this, Laslett (2003) also used the injection protocol based on Schwarzer (1995), but only patients who reported an 80% relief of symptoms (based on comparing pre and post injection pain rating scales) were scheduled for a second confirmatory injection. This presents the possibility that subjects may have been recorded as having a negative response to the first injection and so not passed on to the next confirmatory injection, which may have shown a positive response. This was not the case for van der Wurff et al (2006), where all subject received both long and short term injections, thereby eliminating this possibility. These results show that when three or more pain provocation tests are found, there is a high probability that sacroiliac joint pain is present. Further studies from Kokmeyer et al (2002) and Arab et al (2009) add further weight to this; however, these studies did not compare tests against a gold standard, but instead compared the inter tester reliability of a using a multi test regimen. Although Kokmeyer et al (2002) used the same test as studies by Laslett et al (2003) and van der Wurff et al (2006), Arab et al (2009) used only three provocation tests: FABERs, thigh thrust and resisted abduction. Laslett (2008) states that if 30% of patients with low back pain have pain of a sacroiliac origin, and an individual has three or more positive pain provocation tests, and then there is a 59% chance that the patient will have SIJ pain. This rises to 77% if the McKenzie method of assessment does not yield the centralization phenomenon. This further supports the notion that three or more pain provocation tests can be used as a clinical prediction tool for SIJ pain. Kokmeyer et al (2002) found a kappa value of 0.70 and Arab et al (2009) of 0.88. It should be noted that the study by Arab et al (2009) recorded results found by two testers, with only one years’ experience each which may have added bias to the results and affected the validity of the results reported. There is a lack of high quality evidence comparing a multi-test regimen of sacroiliac joint tests to the best available gold standard of nerve block injections, and future studies should look to address this issue, by comparing a large population of subjects against a long and short term sacroiliac joint nerve block, and comparing this to a multi test regimen. The studies reviewed are largely in agreement, concluding that a multi-test regimen is an acceptable clinical tool to make reliable predictions of sacroiliac joint pain when compared to the gold standard. This provides services with a more cost effective and efficient method of diagnosing sacroiliac pain. As yet, there is no better gold standard available than a double, fluoroscopy guided sacroiliac nerve block, so despite its recorded flaws, it remains the best option for diagnosing sacroiliac joint pain at present. ↑ 1.0 1.1 Simopoulos TT, Manchikanti L, Singh V, Gupta S, Hameed H, Diwan S, Cohen SP. A systematic evaluation of prevalence and diagnostic accuracy of sacroiliac joint interventions. Pain Physician 2012;15:E305-44. ↑ 6.0 6.1 6.2 6.3 6.4 6.5 6.6 6.7 Van der Wurff P, Buijs EJ, Groen GJ. A multitest regimen of pain provocation tests as an aid to reduce unnecessary minimally invasive sacroiliac joint procedures. Arch Phys Med Rehabil 2006;87:10-4. ↑ 7.0 7.1 7.2 7.3 Berthelot JM, Labat JJ, Le Goff B, Gouin F, Maugars Y. Provocative sacroiliac joint maneuvers and sacroiliac joint block are unreliable for diagnosing sacroiliac joint pain. Joint Bone Spine 2006;73:17-23. ↑ Szadek K, van der Wurff P, van Tulder M, Zuurmond W, Perez R. Diagnostic validity of criteria for sacroiliac joint pain: A systematic review. J Pain 2009;10:354-68. ↑ 9.0 9.1 9.2 9.3 Kokmeyer D, van der Wurff P, Aufdemkampe G, and Fickenscher T. The reliability of multitest regimens with sacroiliac pain provocation tests. J Manipulative Physiol Ther. 2002;25:42-8. ↑ Laslett M, Williams M. The reliability of selected pain provocation tests for sacroiliac joint pathology. Spine (Phila Pa 1976) 1994;19:1243-9. ↑ 11.0 11.1 Schwarzer AC, Aprill CN, Bogduk N. The sacroiliac joint in chronic low back pain. Spine 1995;20:31-7. ↑ 12.0 12.1 12.2 12.3 Arab AM, Abdollahi I, Joghataei MT, Golafshani Z, Kazemnejad A. Inter- and intra-examiner reliability of single and composites of selected motion palpation and pain provocation tests for sacroiliac joint. Man Ther 2009;14:213-21. ↑ Laslett, M. (2008) Evidence-based diagnosis and treatment of the painful sacroiliac joint. J Man Manip Ther 2008;16:142-52.